"The Day of the Defenders!" And there shall come a day...a day like no other... the day of the Defenders! For long months it stood empty, this dark gabled old house on a shadowy backstreet in Greenwich Village, with spiders as its sole tenants and sad-winged bats its only visitors. But now there is life amid the shadows once more. Now there is Dr. Strange. It is past midnight and the Master of the Mystic Arts sits in a high backed chair before a huge burning fireplace which spills warm orange light into the room. The quiet is disturbed as Wong, Strange's man-servant, brings him tea and reminds him of the hour. Suddenly, Strange quickly rises from the chair with his ear cocked to the side because he has just heard his name called out. Strange asks Wong if he can hear the call but Wong doesn't. Strange then realizes it is a mystic call meant for his ears only and sends Wong away. Dr. Strange then settles back in the the chair and prepares to heed the call. In a trance, the magician sends out his astral form to find the source of the beckoning. Dr. Strange is puzzled because he is curious as to how someone knew he had returned to his village abode and to his life as a sorcerer (NOTE: Marvel Feature #1 includes a story entitled "The Return". Apparently, Dr. Strange gave up his mantle as the Master of the Mystic Arts and became a consulting surgeon, Dr. Stephen Sanders. He had instructed Wong to board up his Greenwich home (see Incredible Hulk #126) but he found his home open and occupied by a Dr. Strange doppelganger. The imposter easily defeats the powerless Dr. Strange and puts him into a sleep like death. However, during the sleep, Strange summons the Ancient One who intervenes and gives Strange his powers back. But, with one condition, he can never discard his powers again. Strange then defeats the imposter who turns out to be Baron Mordo. Dr. Strange has return, this time, for good). The call draws Strange's astral form to the hospital where he finds a man, laid up in bed and surrounded by doctors. A man he knows from the past. Yandroth, an evil scientist he once battled amid world's beyond. Strange learns that Yandroth was struck by a truck and that he is dying and not expected to survive the night. The doctors leave to let him die in peace. Yandroth then turns to Strange's astral form, which he can see for some unknown reason, and explains that he is no longer the Yandroth that Strange last defeated, chasing him through numberless universes and then finally, leaving him falling forever through a world that never was. He explains that he eventually stopped falling, and found himself amid a cosmos totally alien to his senses, a place where he could feel the plane's energy and essence flowing into his very being! At last, he was able to return to our Earth (although he does not explain how) and he brought with him a secret beyond all secrets, a knowledge beyond all knowledge. Once, he called himself the Scientist Supreme but it required science and magic to create the ultimate machine, the be-all and end-all of all devices...Omegatron! The machine wears his face and when it speaks his name, it will be the last word the world will ever hear. His voice strained, laced with coughing and short breaths, Yandroth goes on to explain that Omegatron will be automatically activated by his death. It can protect itself with weapons and even hallucinations, and precisely five hours after it is activated, it will explode every nuclear stockpile on Earth! The strength born of madness finally leaves him and Yandroth slips into a coma. Strange, realizing that Yandroth's death is close at hand, rushes to find aid. Strange finds the doctors who, moments ago, presided over Yandroth and using his mystic might, commands them to return to their patient. The doctors then operate on the comatose patient but to no avail. Yandroth dies on the table. Dr. Strange learns of the last known residence of Yandroth and realizes, it is his last hope. Most men would give way, now to the despair which gnaws at a benumbed soul. But, the price of vigilance is the surrender of time... time for regret... time for tears. With speed then, Strange brings his astral projection home and reunites his body and spirit. With a furrowed brow, the mystic master ventures forth anew. Oblivious to the straggling few who may dimly perceive him in the wee dark hours of the morn. Northward he drifts, his cloak of levitation bearing him above the rock-bound shores of New England. To the naked eye, he must appear a man a-dream. His mind's vision fixed on some awesome inner goal... but, the reality of the matter is far, far different. Flying over the water, he finds the one he seeks: Prince Namor, the Sub-Mariner. Strange knows that magic alone with not overcome Yandroth's doomsday device. The two heroes greet each other and exchange pleasantries. Strange wastes no time in coming to the point. He explains that in their last meeting (see Sub-Mariner #22) he learned respect for Namor's strength and courage. At this moment, he is in need of both. Namor expresses to Strange his joy that the sorcerer is no longer in the clutches of the Undying Ones. However, he is in search of his lost father and his heritage and old ties will not sway him from this quest. Namor turns then, to return to the sea but Strange stops him cold by explaining what Yandroth has planned. After hearing Strange's uncanny tale, Namor agrees to aid in the task and suggests to Dr. Strange that there are others who may complement their powers and who are his allies in peril. Namely, the Hulk and the Silver Surfer. Strange thinks this is a good idea as well and, using his Eye of Agamotto, searches out the Surfer. A projection opens in mid-air in front of the two heroes. In it, Strange finds the Surfer, skimming along the outer reaches of Earth's gravity moving at a fabulous speed when suddenly, the Surfer's board strikes an invisible barrier and he is shown to fall earthward, like a wounded osprey. However, Strange senses that the Surfer is not badly hurt yet he may not recover in time to help them. The Master of the Mystic Arts, briefly flirts with the idea of summoning the Thunder God, Thor, but decides that he would probably be battling menaces on world's beyond their own. With a small flick of the wrist, the projection image changes. There is but one with power enough to help them...the projection image stabilizes on the green goliath...the incredible Hulk! Namor watches on in amazement, remarking on how clear the projection is. Strange then sits on the ground in the lotus position and sends out his astral form. No magical cloak is needed for this flight as intervening miles are swiftly bridged. Strange knows that his astral form cannot be seen or heard by humans so he summons his powers and trips the Hulk! The jade giant is miffed that he has been made to look stupid. He turns and grabs a tree and slams it down where Strange's astral form stands. The mystic is surprised to find that something in Hulk's warped nature allows him to see and hear his astral-self. As such, he uses this to his advantage as he flies away from the Hulk and tricks the green behemoth into following him. A short while later, the Hulk draws near to where the vulnerable Strange remains seated. Namor is shocked to see the Hulk leaping and lumbering towards them. Dr. Strange slips his astral form back into his physical self and as he does so, the Hulk picks up a massive boulder and prepares to smash the seated magician. Luckily, Namor intervenes, plucking the boulder form the Hulk's grasp and yelling at him to stop. Strange meanwhile, recovers from his trance and quickly erects a mystic force field around the enraged green monster. Namor and Strange convince the Hulk to cease his struggling and to listen to them. The Hulk agrees, but for only a moment. Strange then removes the barrier from around the Hulk and explains to him that, in the past, he fought along side Namor against deadly foes, and now he has the opportunity to fight for glory. The Hulk explains he has no desire to fight for glory, he just wants to be left alone. However, if they want to be Hulk's friends, he will go with them. 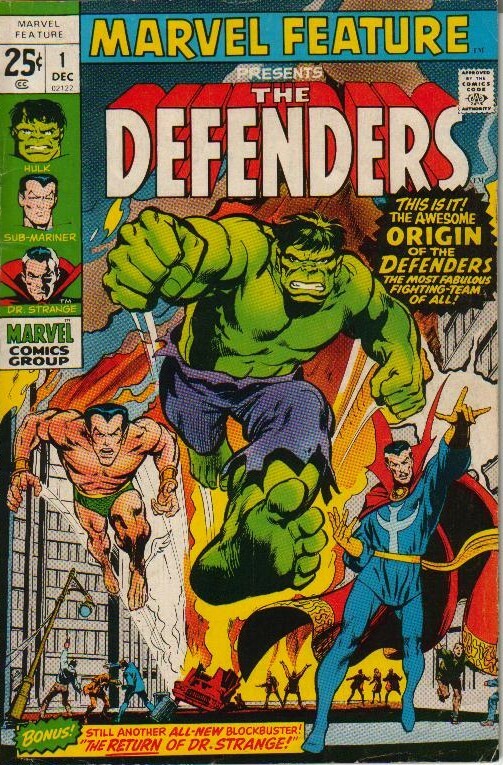 And, so is born the first team of Earth's Defenders. The team arrives at Point Promontory, where people yet treasure the sweet still gift of solitude and where a sole, strangely garbed visitor might be ill-received in the lonely hour just before dawn. If he had not the sorcerous skill to cast an eerie spell. Dr. Strange approaches an old homestead in the guise of a well dressed businessman as his friends hide in the shadows. Knocking on the door, an older man answers and Strange asks the man if he knows the location of a new building which was erected recently. The old man's wife suggests that he may be referring to the new lighthouse. The older mans agrees and gives Strange directions. Point Promontory, where surging waters pound the rocky New England shore and the fate of the world is lit by arcs of stabbing light. Dr. Strange feels no doubt that they are at the right place for there has never been a more elaborate lighthouse built. Hulk asks why they do not rush the place and get their enemies. Strange explains this by showing the Hulk through magic, that a bubble of invisible energy shields the place and there is also an electrified fence. Dr. Strange tells his two comrades that they must destroy these barriers for his magic to be effective. Hulk likes the idea of smashing but Namor is none too pleased to be told what to do by Strange (NOTE: the shape of things to come for sure!) but he does it. Namor then dives into the ocean to enter the lighthouse from the backside. The Hulk however, is more direct. He picks up a huge boulder and throws it through the electrified fence. Entering the hole, Hulk plods recklessly onwards, when suddenly the floor beneath him shifts and he is nearly dumped into a pool of acid. Burning his foot, this only enrages the green behemoth who bemoans that someone will pay! Then, suddenly a wall of searing fire erupts in the green giant's path, mammoth flame throwers whose deadly tongues dart murderously out, threatening to engulf even the mighty muscled Hulk. Meanwhile, below, Namor swims effortlessly through the water and reaches a underwater chamber. Easing himself from the cold water, he finds a heavy metal door and with a two handed blow, he knocks the door from its hinges. Running down a stone corridor, Namor suddenly realizes the walls are beginning to close in. However he has no intentions of being crushed and with his powerful arms, he destroys the tunnel. While on the surface, the Hulk has crawled under the flames and, upon reaching the turrets, crushes the throwers. The Hulk cries out that he is coming! On a third front, the moment has arrived for Dr. Strange to act. He assumes his astral form and rises into the air. His ethereal body penetrates the bulwark of metal and magic which protects the lighthouse and he enters the main chamber. Inside he finds the Omegatron, a massive silver gray computer, and he is shocked to see the machine has a face and that it speaks! The machine detects his presence (able to see astral energy) and welcomes Dr. Strange. Omegatron then explains that it is Strange who will be responsible for the doom of all mankind. It seems that Yandroth used Strange to gather the raw power needed to activate his machine and destroy the Earth. As the Hulk pounds on one end of the chamber and Namor on the other, the two titans work towards each other. When they both strike simultaneously upon the sensitive surfaces of Omegatron, the machine will speak his maker's name and loose nuclear cataclysm upon the planet. Strange is shocked that he was used so easily in this plot. Just then, the Hulk breaches the inner chamber and Namor hammers through from the other end. Realizing he cannot stop the pair in his astral form, Dr. Strange leaves and quickly re-joins his corporeal form. In mere moments, he returns and exclaims to his friends that they must NOT attack Omegatron. However, both Namor and the Hulk think that Strange is an hallucination and decide to attack him! With blinding speed, Strange calls forth a pyscho-shield which deflects the Defenders' blows. He then sends out the mystic Eye of Agamotto, first onto the Hulk and then to Namor, making each of them see the other, as he is hoping to buy some time. The Hulk sees Namor as a flaming red monster and the Sub-Mariner sees the Hulk as the slayer of his beloved Dorma, Llyra! A moment of taut silence, then like flailing green pistons, the Hulk's mighty arms reach out for the man-monstrous form before him even as, with a vengeful snarl, Namor leaps for the throat of his enemy. The Eye returns to Strange. Omegatron applauds Strange's effort but he explains to the mage that even the very vibrations of such a clash of titans will soon feed its circuits with the power they need to detonate the atomic piles. With each blow the moment draws nearer, ever nearer. Suddenly, Strange sees a way. Sensing, that this machine cannot be destroyed because of the potent combination of science and sorcery that birthed the computer, Strange calls upon the powers which rule the Fourth Dimension and enchants the machinery with time's suspension. Omegatron sits frozen in time, each moment for the machine will now be an eternity. The Hulk and Sub-Mariner awake from their enchantment and stop when they realize they are fighting each other. Moments later, after Strange has brought the confused heroes up to date on what transpired here this evening, the group decides it is best to part company. Namor is frustrated that while they sought to be Earth's valiant defenders, they in fact were very nearly its destructors. Strange likes the sound of the word "defenders" and indicates that, should they ever need to re-group again, it will be as the Defenders! Hulk says that he NEVER wants to get together again...after all, he was once an Avenger and never liked that! (NOTE: This issue also features a "fabulous fifties featurette" backup story called Sub-Mariner and the Icebergs which tells the story of a young Namor who blockades a fleet of ships with icebergs because he thought they were going to attack his nation. In the end, we learn that they were merely searching for uranium. A truce is called when the surface dwellers warn Namor that his moving the icebergs has caused a massive underwater avalanche. Namor's empire is evacuated before disaster strikes. His nation destroyed, but his people saved, Namor and his people set out to rebuild there world. This story is not summarized completely as it has no bearing on the Defenders series or the team).